If it’s a Tuesday night and you’re near Centralia’s Lewis and Clark Hotel, close your eyes for a moment and listen for the sound of the Two Town Tuners. 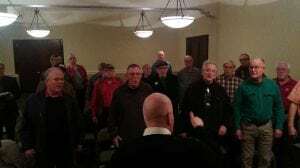 A men’s barbershop chorus comprised of 20 members, the four-part chorus chimes out tunes from ages past, from gospel hymns to the Temptations. Evocative of days gone by, their harmonies will transport you to the golden age of barbershop music and will make you want to put on the hat, vest, and bowtie and croon along. Like their music, the Two Town Tuners have stood the test of time. Beginning in 1970, they began performing at local rest homes and senior residences, and gave several public performances throughout the ‘70s and ‘80s. By 1992, however, membership had dwindled down to only one member paying dues, and barely keeping them registered with the Barbershop Harmony Society. With a name paying tribute to the Twin Cities, the Two Town Tuners have moved practice locations between Centralia and Chehalis throughout the years, from the First Baptist Church of Chehalis, to the Centralia Community Church of God, and to their current location in the Lewis and Clark building. As the pastor of the First Baptist Church, current president John Lyttle first discovered the chorus in 1985 when he heard them performing from the basement. Between work and being involved in another gospel quartet, John decided to wait until retirement to join the Tuners, and has been a member since 2000. “I love to sing with a bunch of guys that can sing well. I love sharing it with people that enjoy it,” Lyttle said. In recent years, the chorus has been performing monthly in senior residences and doing special events including the Garlic Festival, the Southwest Washington Fair, the Morton Blueberry Festival, at the Fox Theatre, and their main event – the annual spring Saturday Countdown show at WF West High School. At the 2017 concert, the Tuners will be joined by their neighboring Olympia chorus, the Puget Sounders, as well as the female quartet WINK, the reigning Sweet Adeline district quartet champions. In the second half of the performance, the audience will have control of the set list and can vote for which songs they want to hear via notecards placed on the tables. In addition to showing off their well-tuned pipes, the chorus is also raising money to send two or three teenage singers to Harmony Explosion summer camp at Pacific Lutheran University, as well as private college scholarships to two local high school seniors. Because the annual show is the main source of income for the chapter, the Tuners will also be accepting cash and items for a door prize raffle, in addition to offering advertising spots in their show program. While many of the Tuners are 60+, the group is open to all ages, whether you’re 11 or 91. Although it can surely be intimidating walking into such a well-harmonized chorus, John encourages newcomers to stop by auditions, sing along and see if they enjoy it. “A lot of barbershop choruses have tryouts, and you can’t join without tryouts. We just invite people to sing,” said Lyttle. While harmonizing in a chorus does require its members to know how to sing and carry a tune, the Two Town Tuners don’t require you to learn how to read music. In fact, director Bob Hart learned how to sing while gargling salt water in the ocean, and John was self-taught. “You’ll know when you hit the right notes,” said Lyttle. Although many of the songs are sung in four different parts, all members learn the same way and learn how to sing in conjecture with people with different sounds. Singing mainly for the joy of it and only competing a handful of times in their history, their sound is strong and unified, developed through years of dedication and teamwork. “We are blessed to have a number of really good singers. That’s why we sound like we do for a small chorus,” said Lyttle. 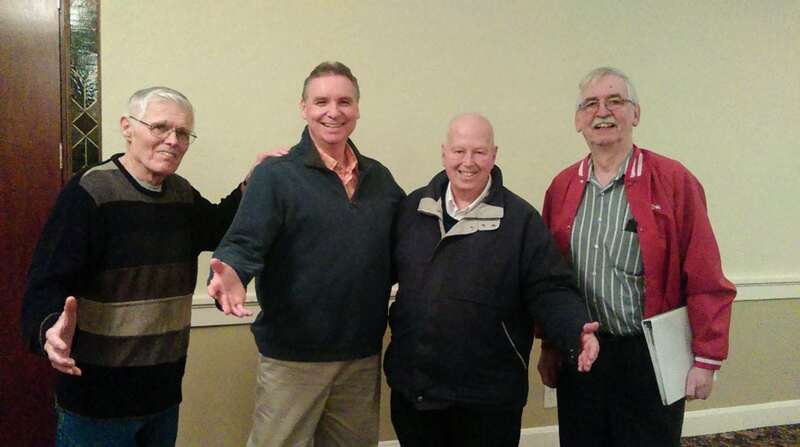 With a fluctuation in membership over the years, John hopes to see the chorus welcome new members to keep the legacy of the Two Town Tuners alive. “The door is always open and we’re looking for more singers,” Lyttle said. 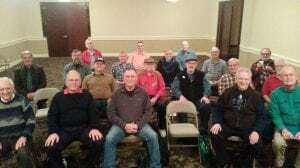 For any men interested in joining the chorus, they are free to stop by weekly practices held at the Lewis and Clark Hotel in Centralia from 7:00 to 9:00 p.m. If you would like more information on upcoming performances of hiring them for an event, please contact director Bob Hart twotowntuners@gmail.com or at 360-736-2197. But most importantly, stop by the Saturday Countdown and experience the Tuners in all their glory.